Over $2000 savings compared with regular, in class training programs*. Easy access to engaging multimedia content. * The $2000 in savings has been calculated based on market research of comparable, in class training programs. 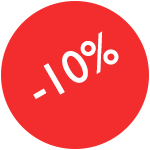 Get a 10% discount if you register more than 10 users! Perfect for companies with multiple trainees. Manage your registration easily, through our multiple user registration process, and get a 10% discount on the total price.